With Wire, you can audio+video call, message, and share pictures, videos, and music in simple, beautiful conversations. 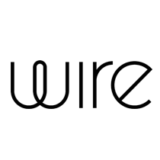 Wire works on your phone, tablet and desktop, for personal and group conversations. Wire is available for iOS, Android, MacOS, Windows, Linux and web.